Another day about half over. Met with Annie, Esi, and Anastasia this am in Bentil’s office. Discussed many things, including all of you GCJ alums! Esi discussed the news that the government is taking over Manye JSS, but not the primary. However the problem? is that the gov’t won’t allow Manye to collect fees from people so they have only 30,000 cedis per child per year to work with (30,000 cedis is about $3.50 US!) What the govt does is charge for taking exams, as much as 40000 per exam, and if you don’t pass, you pay again. I guess that’s how they improve their revenue situation. The gov’t school is providing textbooks, but Manye teachers don’t like the textbooks, etc. etc. etc. Said Hi to Bentil, too, and others who just dropped in. Then, we took off with Thani in taxi to “the site”. I’d been there at 9:30–no M Biney (MB), just a few workers kind of hanging out. I was there at 11:30 and he had just come—but that’s James’ problem. I’m not here to supervise. Meanwhile, since Annie, Essi, and Anastasia had a “car”, we of course stopped at various places, delivered 6 bags of cement to someone, etc.! But it was fun. Then we WALKED from the site to Manye, and I can vouch personally that ‘s a pretty good trail, needs a little weeding in places, but it is owned by Manaye, who have promised to clean it up. It took exactly 10 minutes, stopped twice to talk and also Anastasia didn’t have the greatest walking shoes, so we’re fine on that. It ends in a small settlement, with friendly people, a not very busy road, and there’s the school. So, I’m happy about that—I think all the kids will just scamper to school in 5-10 minutes probably. Then I came home and have been working on James’ computer all pm. Have managed to update XP and Internet Explorer, but problems with the virus checker. (Windows LiveOneCare). It says it’s seriously in need of updating, but I can’t do it. Well, I’ll try Leif now and then and see if we can’t make a connection. Tomorrow I’ll probably get anastasia’s cmputer and bring it here to work on. My room is fne—small, but adequate. Tomorrow I’ll walk to the site. PLEASE UNDERSTAND I CAN READ YOUR EMAILS BUT CANNOT EMAIL OUT. Also, the wireless here is not working, so I’m on ethernet, which might be the problem. LEIF: DO YOU HAVE ANY IDEAS? The guy here is really pretty good, but on this he can’t figure it out. I remember Susan had the problem before at the i-net cafes, but I don’t know if it ever got resolved. Also, Rich, I think it’s fine it people just read the blog now on their own and you don’t send the emails—would be better. I’ll try to update pretty often. I forgot to say yesterday that I had the program from Barbara’s ordination, and the K’s and I sang all the songs together—they knew all the tunes, although they were a little shaky on “ode to Joy”. Also, Charles showed up, so he’s still here. And I showed them the photo of the joyful Barbara—I’ll try to post it. thanks Rich for updating people, but I think they can look at the blog now, which would be better. Hope all is well there. I had a sad moment at breakfast, looking at the dining area without all my friends, and also thinking about Renee, my dear cousin. How alive and wonderful she was and how I’ll miss her. Also, I found a better spot for cell phone reception, thanks to Mike—my “place” is not good, but he showed me the “best” place. I think we’ll have rain tonight. Good to see everyone today—a nice welcome and time to catch up, while walking and riding around town. Mahara, if you’re reading this, they call Thani “Mr. Mahara”!!! Gifty dropped in to the K’s home and she and I and Justine spent a couple of hours discussing her work with the women’s microlending program. Diana, we gave her what came to 690,000 cedis (James waited so I could give it to her), plus the other things you sent. She seems to be getting a handle on the whole thing. She and James have agreed that she will carry out the women’s entrepreneurship part of the WCHH mission in Axim, starting with the women who met when we were there, and seeing who is really energized. She was very enthusiastic, but said it would be difficult to start at first, because she’ll have to start the groups and meet with them frequently. She was about 71 groups going, at various stages. She explained the whole process, which is a bit much to type here, but it’s a very interesting way of organizing where the group itself takes the risk (5-25 in a group) but loans are individual from 1M to 5M cedis. They pay back weekly at 14% interest which they thought was very low. She has a guy who has written a software program for her to track all this—a specialized program. I met him, but we had to rush and I would have liked to have talked with him a lot more. I also met one of hr staff members, in her office, which is really quite nice and modern looking. Meanwhile, Frank was thrilled with Leif’s passing one of the computers onto him. I have brought Quicken to work with Anastasia, and also a copy for Frank. He can use it himself, and also to coach her, if needed. He loved the book, Suz, on digital photography, and also the Photoshop Elements that leif had suggested. He was just bubbling over with enthusiasm and energy—good to see! His Govt’ service is going well, and as a bonus he is learning the Ghanaian tax code, which can’t hurt. James and Justine loved the fabric we sent—I’ll pass out the rest as I see people. Yesterday, J and J and I spent about 6 hours in a meeting about WCHH, where we are going, getting me up to date, etc. It was an excellent session. Justine is getting very involved, and has good insights, esp. as to staff, and children. Very helpful. I can’t type it all out, but I’m taking lots of notes on my computr and will give the GCJ alums a “report” when I return. So, here I am. I think I’ll close off now. I just found out via email that one of my very favorite cousins has just passed away unexpectedly—kind of hard when you’re sitting here so far away. But I have a lot to do here. Tomorrow, I’ll start. By the way, Mr. Elimah (sp?) called James one day and James told him I was there. He asked to speak to me and was very cordial and asked me to meet with him. So that’s a good Town Hall followup place to start, probably. The Dist. Social Welfare man wants to see me, too. Also, Chamsou is coming on May 10 for three days! So, that’s great news. And according to what Patrick told James, “two white ladies” showed up at the site last week!! Who, I wonder? I’m curious. I asked James if Patrick had asked where they were from, but evidently he was too flumoxed by this unlikely event to get any facts. So, James has turned over to me all receipts, account books, etc., and tomorrow pm i will start to work on that, and hopefully in a few days, when I’ve figured out things, I’ll start to work with Anastasia. WCHH Board will probably meet soon, before Chamsou comes. Enough for now. Thank goodness I’ve connected. I admit to feeling a little guilty about enjoying water and electricty—gifts from God. I did kind of go back to my early farm days, when we carried all out water, etc., but it takes a while. James and Justine were upbeat, positive, and their usual optimistic selves. This in spite of nearly no electricity going on for months now, and no tap water at all for the last nearly 4 weeks. Daughters Elfrieda, and Maureen, and nieces Edna and Linda, carried water from the tap across the street into the house for 2-3 hours day—on the head pans. The amount of work created by this situation is really daunting. Ravyn’s headlamp and wind-up flashlight were an ENORMOUS hit. I wish I had brough a dozen. They immediately put them to use. Justine is baking 100 loaves a day about in her gas oven downstairs, but when it’s dark, she can’t, but last night she baked them with the headlamp on. I helped some. She is making a delicious “tea bread” that she’s able to sell readily. We delivered them around to shops and they were gone in minutes. So that’s going well, as is her mining uniform business. James can get internet in spite of all this, if his battery is charged, but there’s something wrong with his computer. We tried to run the virus checker, etc., but no luck. I took it with me to Axim. The wireless is down here (I’m on ethernet now), but when it’s up I’ll start plugging away at it, proably with Leif’s help. On Friday I was surprised to learn that we were going to a durbar! It seems the vice president of Ghana himself, a Muslim by the way, was coming to Nkroful to dedicate a development project—turning Nkforful SS into a science and technology high school!! Much investment! Gifty’s husband is THE HEADMASTEr, so this was great. Anyway, our lower Axim Trad. Council people were there and I was very warmly welcomed. I was invited to wear “the cloth”, but I declined because it was so terribly hot, and I didn’t want to draw a lot of attention to myself, either. There was not only our own little group, of the King and council of elders and thier wives, etc., but also about 12 other trad. councils plus all the elccted officials from Mr. Elimah on up to the VP himself. AND, Marcus Garvey, the son of Marcus Garvey was honored. A good day of lots of pomp and circumstance, warm welcomes, dancing, drumming, etc. I’m going to post so I won’t lose this. Whew. Finally I’m at an internet connection, but it’s none too good, so we’ll see. I arrived in Ghana almost a week ago, and was met by Frank and James. Went to Quass Hotel, and next morning headed for Sekondi. I’ve been with James and Justine in their home until this morning, when we came to Axim, and I’m now in the NEW internet/business center at the ABH. Sadly all the staff we knew, but Mike, are gone. I think there’s a story, but Mike won’t tell me—all new people–nice but new. Michael Biney, James, and Sammy the carpenter just left. They spent the morning with the king, Mr. and Mrs. Abbey, and worked out the rest of the contract with Mr. Biney taking over. The touchy business of finishing off the roof, etc. is left, and Biney is an expert, as his carpenter in roof joining, etc., so it’s for the best. He is very enthuastic about the building. I hosted a lunch at the ABH hotel just now for Michael, James, and Sammy, as a way to welcome the new contract, etc. The hotel now has solar hot water panels next to many of the huts. Anyway, I’m going to post this, to make sure I don’t lose it, and then I’ll go back to other news. 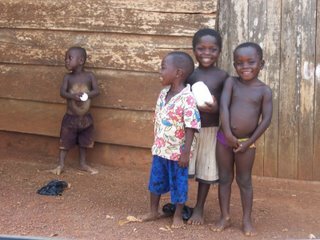 Many of us are back, adjusting to the re-entry, reverse culture shock (gleaming bathrooms with hot water, showers and consistently flushing toilets, for example)… while Leif, Rich, Jerome, Louise, Tom, Barbara and Diana continue to enjoy further exploration of Ghana. 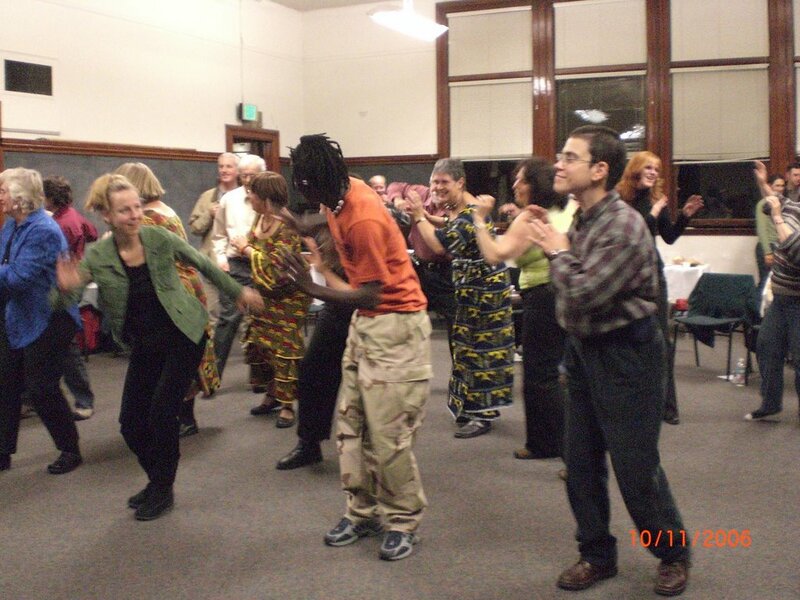 **the orphans: what a thrill to meet them (at our introduction to the lower king of Axim) — and dance with them! The Board of the Western Christian Heritage Home will have to take on the daunting task of identifying those in greatest need, as the number of applicants exceeds the capacity of the orphanage. 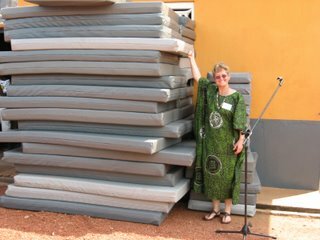 **the mattresses: US delegate Jeannie raised the funds for these greatly needed mattresses for the hospital — now patients can rest in comfort to recover better. 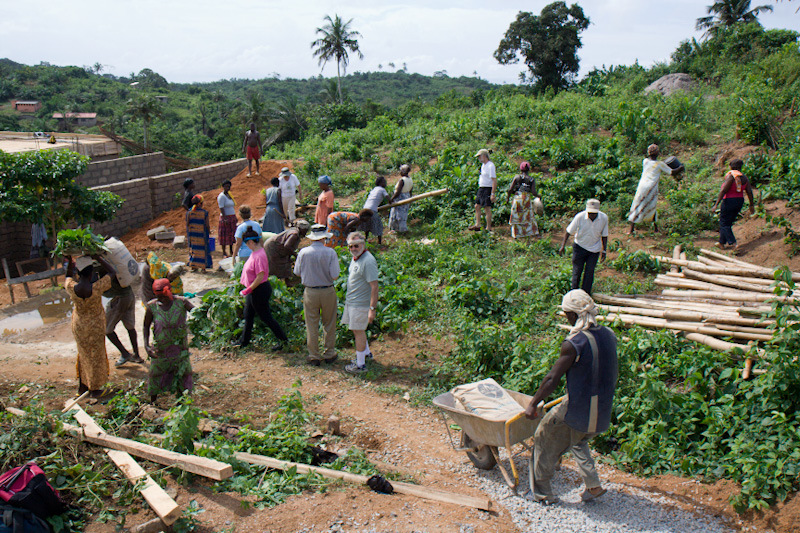 **the orphanage worksite: we enjoyed a great (though very hot and sweaty) day of work on the site with North American and Ghanaian delegates plus a number of the women from the town. By the time we left, the second story was well under way. **Town Hall: an extraordinary day of inspiration and empowerment, with over 150 diverse voices heard from townspeople, envisioning the desired future for Axim and exploring the challenges that need to be dealt with. Barbara G spoke with Womens Aglow group here, and Maryanne went with her. Others went for wade in water to get into a boat that took us to the island with the Axim light house. Most climbed to top of light house for a grand view back to Axim and out to sea, and watched the fishing boats ride the waves in and out of the bay. James K really gave of himself as he carried Jerome from land to boat to load, off load on island, and then reverse back to mainland. What a gentle soul we’ve seen in James K.
Afternoon to Nzulezu Village. Took over an hour bus ride, then an hour row boat ride with heavy oars, to reach the village that is built on stilts in the water. Then hour boat ride back, and long bus home. Rich spoke at a Methodist church in town, and several delegates went to hear. Delegates coming and going, starting to pack. Jerome visited a family at the hospital, as the wife had been in car collision north of Axim and had double amputation of legs. He went to give hope since he’s here and doing fine after his own amputation. Closed the GCJ time in Axim with circle and speaking highlights with each other. The King of Lower Axim came to bid us farewell and thank us fo all that had been done with the orphanage, the town hall meeting, all the help given throughout Axim community. He passed out our certifiates for the American delegation with our Ghanaian names they’d given us the Saturday before and made us honorary citizens. Closing dinner was a huge baracuda fish — very good! Back on American time now, departed hotel about 5 minutes late, rather than our typical waiting 1/2 hr or more to start things in Ghana time. Bus to Takoradi, where James K, Barbara and Susan P were at SKYY news station for interview for TV. We’d already learned that the prior Saturday celebration with Lower Axim King and chiefs had been on national TV showing all the hospital mattresses that Jeanie had spear headed as a sub-project for this trip. While the three interviewed, most of us stood in line exchanging anything we had for Ghana currency at Foreign Exchange. Lunch with Catherine R from Bellingham who’s living north of Cape Coast and runs a travel agency there to support an orphanage with funds; and then on the bus again. On to Kakum National Rain Forest — and a walk on the canopy walk high in the trees. Arrived into Kumasi last night at hotel about 10:30pm. The drive north to Kumasi in the evening was filled with a long and wonderful electric storm show off in the sky to west. Arriving at hotel, we all worried about bus clearing the entry with the luggage on top. The security guys outside said not to worry. Then we heard a “crunch”, and ended up backing out. Thankfully not our luggage, but it had go the ladder at back of bus. Alll were tired, and went quick to bed. Rumors this morning of Tuesday is that somehow Tom and Louise got the hotel’s honeymoon suite last night, though we were all supposed to have similar rooms. Annie and Anna Esi came with us from Axim to be with us in Kumasi. Breakfast of a tasty omelette, toast, jam, oatmeal, and the coffee or milo that we drink. Group split into 3 groups for market morning. One group met up with Elizabeth and Charlotte, who live in Kumasi, relatives of friend back in Seattle. How wonderul that Charlotte guided the one group through market for purchases before going to palace museum. This market is like none other in world. Huge! so many stalls of small 1-2 person businesses. Food, meat, clothing, fabric, jewelry, shoes, household, just goes on and on. Tight quarters also, as most opted out sooner than the alloted whole time because of claustraphobia. Of the world travelers in our group, none had seen or experienced anything like this market. Tonight after dinner we meet Charlotte Abaka, a Ghanaian woman who is highly regarded in areas of Human Rights, and helping Liberia with trying to stabilize and set up infrastructure. She is representative to UN for Liberia from Ghana. Then we lose Jerome and Rich who head north tomorrow, and Anna Esi and Annie back to Axim. Best to all, and prayers. And especially family and friends back in Washington State where the internet news shows there is record rain and rivers flooding. Diana blogging for the group. Blogging for the group’s big day is Diana. Breakfast started here at hotel with Administration of secondary school coming to breakfast to award and give gifts to Jackie J and Jerome C for their work in the secondary schools here this week. About 4 came from the school administration to make the presentation. How great it was to see our current and retired teachers in the delegation honored. Upon returning to the beach, we waded through the water again to dry sand, and there was a porpoise that had been caught — by accident. A tuna had been on the line, and the porpoise had gone for the tuna and swallowed the hook. Around the beach, the catch of the day was being distributed, and women cutting up some fish. The meat looked like a wine color of red. While on the boat trip, Barbara G and Maryanne W went to Women’s Aglow meeting where Barbara spoke this morning. They reported a good session with the women. After lunch, all but two of us in Amercan delegation and most in Ghanaian delegation headed by bus to Nzulezu village. To get there, we rode about 1 hr, then had to canoe via canals and a lake, paddling about 1 hr, 4 or 5 of us to a boat. This village is well known because it is on stilts in the lake. Once there, we walked the “main path” above the water with their housing and school rooms along the way. Primary education is done there, older goes out somewhere to school. Protocol always means you visit the chief, and tell him of your visit. Our Ghanaian friends gave the chief a bottle (probably gin), and then translated some history the chief told us about. Originally the people here were from Mali, elsewhere in Africa, and came here and settled to avoid war. Intermarriage occurred over many years, and now they call themselves Ghanaians. Returned via the boats, and more paddling (and these paddles are of very heavy wood!) and got rained on. Here in these boats a few of our new Ghanaian friends from Axim in the delegation came, and it was also their first time in boats, hanging on tightly, and first time to Nzulezu. Tomorrow Rich will be giving the sermon at a Methodist church. Others are going to various churches and spending their last day in Axim. The Monday morning departure early will come too soon. Sunday evening the District Executive is coming and hosting a banquet at our hotel restaurant for our last night together. How can it be that we leave Axim on Monday? So soon!! We’ll all cherish tomorrow and our last visits with folks here. Monday will be drive to Kumasi via lunch with Barbara G’s friend in Cape Coast. Dennis, our psychiatrist and hence, Dr., has helped arrange help for Ablema, the young 13 year old girl with eye problems. About 6 months in Cape Coast with treatment and lodging with Dr. there should cost about $500 USD. We hope to get enough to help the family make this happen. Signing off for the evening, Diana, blogging again today to help share with family and friends back home. Posting this Saturday mid-day from Axim Ghana, Delegate Diana. I see you’ve not had much to read the last few days, so I will try to fill you in. Wed. 11/1, we all worked at the orphanage site, clearing land, carrying scrap wood to piles, gravel, sand, and water for mixing cement to lay rest of second floor. The women of Axim responded to call for volunteers and came with their pans which carried gravel, sand, and water when placed on their heads. A few of us tried, but it was tough. The best were Jeanie and Suz who got right in line and carried the heavy contents. Ravyn, Jeanie, Susan, and Barabara went to check out sanitation in schools. The condition is one of which they discovered no water or running toilets. This inspired Ravyn for the Engineers without Borders project she will be proposing. Off to Anna Esi’s village, called Okonu, and Susan H. and Jeanie gave presentations to adults in community, in a borrowed school room. Presentations on hygeine to help control infections and HIV/AIDs where many were pleased to receive free condoms. JJ and Mustafa did the translation and JJ’s second career might be an HIV/AIDs educator instead of journalist…. Louise filmed while there, and we had all the school kids who wanted to shake every hand of the few of us Obrunyi who had come. Returning by bus we stopped and had coconut cut for drink, and then cut to eat. About 7 or 8 coconuts cost 8000 cedis, which is about 80 cents. Evening at beach for dinner and entertainment from local dance and drumming group. Wow can they move! Leif had his eye on a big drum, one shaped like a torpedo, wondering if he could get one home. About 9 or 10 delegates went with Mustafa to his Muslim village. Spent a few hours there. Our delegates had to dress more conservatively to go there. Especially shocking for those who went was to observe the women in the village contained behind a thick cloth barrier, as they weren’t to be seen by the men. This fueled the Gender dialogue Part 2 when men and women came togerher in the afternoon. In the a.m. Diana visited the Women’s training institute in Axim. They learn dressmaking, hairdressing, catering, batik, and more. Fees are about $80 for 3 years, enrollment at 70, can handle 120, but many can not afford to go to the school. With the hairdressers, I offered to let them touch my hair, and they eagerly accepted the offer; They were so suprised and said “It doesn’t feel like ours.” Found a computer room of 20 computers, 10 worked, were 16 MB ram, and using Windows 95. Abysmal. Need to get more current equipment here for them, and share with the secondary school a few kilometers away. Friday a.m. Mahara and Dennis worked with Concerned Elders Assocation — teaching them more conflict resolution tools. Mahara will follow up during her 6 week stay past our departure. Friday evening the delegates made dinner together. We’ve been eating Ghanaian food, and now people shared food they wanted others to try. Amercians did: stove top chicken dressing, macaroni and cheese, matzo balls and chicken soup, dried apples, and more. Jackie and Jerome were awarded this Sat a.m. at breakfast an award and appreciation gift from schools for having taught there. How grande! Better post before I lose what I wrote– these computers are slow. Dinner tonight is on the beach with a bonfire — celebrating a great day with the Axim community. 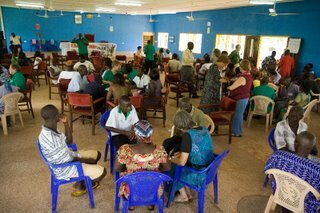 This was the “Town Hall” day, where we facilitated a large scale change intervention to assist the town in gaining energy and inspiration to deal with it’s problems. I hope someone is posting the blog today for us, though I’m contributing this before I sign off from computer. The Ghanaian and N. American delegations were in full action today, facilititating the large group through the Town Hall process we’d established. 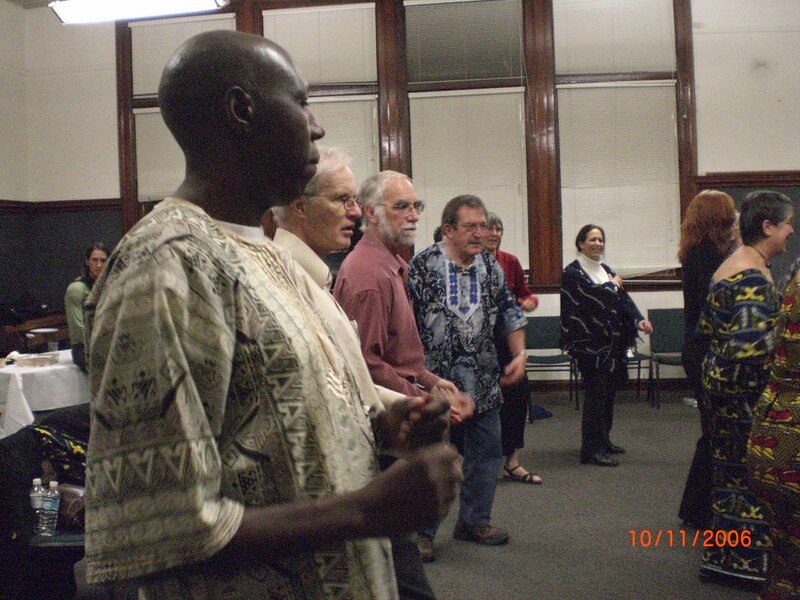 Much thanks to Susan P, Mahara, and Dennis with the Ghanaian folks, Bentil and Old Soldier for their work. The day was co-facilitied by Susan Partnow and James Kainyiah — masters together working the people. I’ll leave the day’s activity to be posted by the blogger of day, though I will tell you from my perspective it was an energizing day to see the things they need to do here, and ideas they have. Music used throughout day was fabulous, you can’t help but get up and dance the Ghanaian beat. Tomorrow we work on the orphanage — yeah! Even before sunrise, the day was eventful, and continued on throughout the day. During the late night/ early morning, we heard loud thunder clap and rain pour down. The rain was not like at home in Pacific Northwest where the downpour occurs and moves on through, it instead just kept going for a long time, lulling many back to sleep. So what happened here today? We’ve just wrapped from a circle this evening where we heard from many about things today. 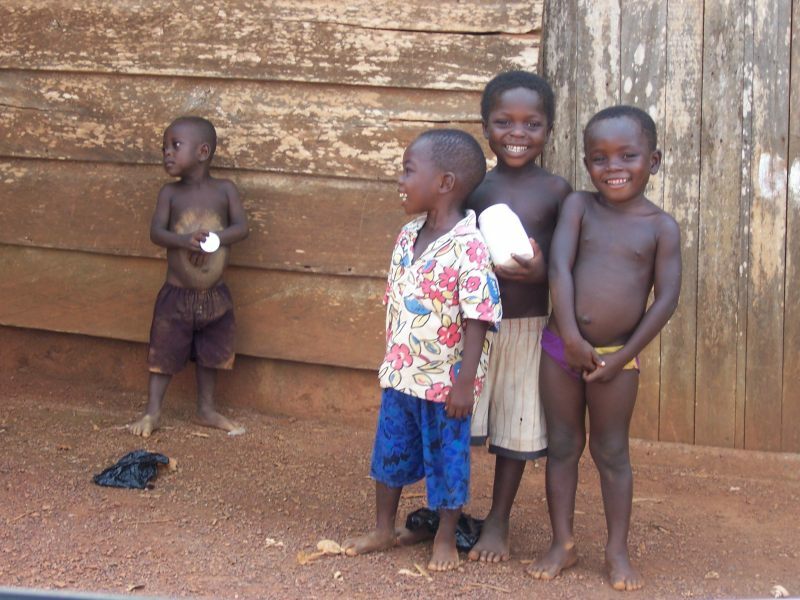 – Jackie returned from a overnight stay with Dina in her Ghanaian home and reported a great experience. The two together can be seen laughing a lot together and having a good time. – School visit: Jackie & Jerome, and from Ghana, Dina and J.C.
Leif and Tom spent time with Bentil in his office “downtown Axim” and now 3 computers have been set up. Frustrations seem to exist more in technology area about needs for stuff than for expertise. Power went out in Axim, and the guys went for a trip to Takoradi to search for some equipment needed. All waited early to be picked up, then ended up with “taxi” arriving at the nursing college after the designated time. Ah, this time thing, definitely a cultural difference. The person who was to pick them up was surprised to see them because she was getting ready to drive to take them to the college. The students were split into two groups. This way both groups were manageable and got to be with both Jeanie and Susan for the information. Jeanie taught infection control and Susan H. talked about HIV/AIDs with the students where she enjoyed the students being open and telling her about AIDS in their culture. Workshop to start at 9:00am, 60 written special invitations to specific women. None there start time. Ah, Ghanaian time….. by 9:10 we had a few and began singing and dancing in circle started by Gifty, and aided by Mahara and Susan P who had come to see the start. The women enthusiastically start singing and dancing. I wish we had recording equipment. In the King’s Palace room we were using, the voices sounded wonderful, full of life & smiles were infectious. Gifty was a master facilitator speaking in Fanti (spelling?) language and shared wisdom about time management that made an impact on the women who at end of day said they were seeing their time as an asset now and they’d use it differently. Tom had brought a chorker video from the US about smoking fish. 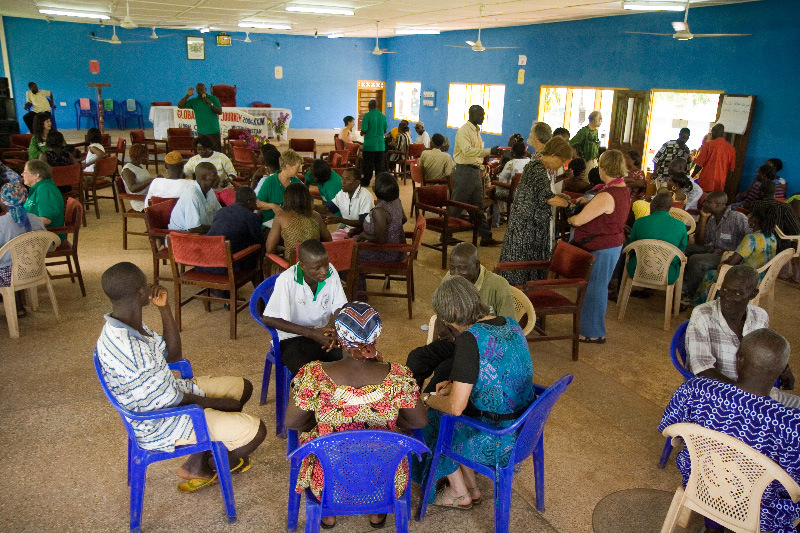 It was watched with interest by the Ghanaians, affirming they were doing something good since they saw it on the computer screen, and lead them to have much discussion. Anna and Annie were the great women of Axim for us — when lunch was late, they set out to find the caterers and what was occuring. Lunch arrived 1.5 hrs late. (That power outage in Bentil’s office that sent the guys to Takoradi had impacted the caterers, so food didn’t arrive until cooked, after the power came back on.) When the food did arrive, all were hungry, and wanting food. However, the 60 invited had grown to 130++ attending. As concern and arguments grew about receiving food, especially for those intended, I could see this was getting out of hand fast. How does one repeat the 5 fishes and 7 loaves? This was a question in my mind. So with Gifty’s help, the group was quieted and I spoke with her translating. Said something like this: “As I spoke this morning, we are women of the world called to solve problems together, and we can, no need to argue. We’re sorry the food arrived late, and thank you for waiting and being here. however this is what we have. We as women can solve the problem. We can share so all get some.” I offered my own lunch out to make sure they ate and said 2 or 3 could have it together. Rest of food distributed, with harmony and all was worked out. This story got around to many of the delegates who were amazed at how the “almost battle” was ended. A reflection of my own is that this shows us that in our world where we have imbalance, some with food and some without, that if we all pull together, we can help each of us to participate in taking care of all. I was called on to speak with the women more than planned, on short notice. It turned out fine, and the message sent through me from Spirit was perfect in the a.m., and got reinforced settling the food issue at lunch. In the afternoon the women received accurate HIV/AIDS info from Susan H, translated by James (JJ, our journalist). This had it’s comical moments as Susan led the presentation and JJ tried to convey the information. A missed Kodak moment was when both were in front of the room demonstrating how to use a condom. Some of you may wonder what the women took away from day. Here’s a snapshot of their thanks: for the accurate HIV/AIDS info; for learning they don’t have to stay away from people with AIDS and they can go near them, (which is great since our orphans designated for the orphanage are parentless mostly due to AIDS); will treat their time differently and use it wisely; will not take/spend money from the income in business until all bus. expenses are paid; and one who said she learned that when her husband didn’t fish and bring back fish for her to smoke, she could learn to do it herself and go fish. Sometimes the session felt very chaotic, then to hear their learnings, I knew Spirit was working. Our videographer, Louise Wilkinson, started with the women’s group and then set off on a schedule to make it to some of the other happenings today. We missed her at dinner tonight as she is trying to get over a cold — something that most of us from N. America have come down with while here. James, our journalist from Ghana, was called into action numerous times to be a translator. A fine job done! All spent some time in afternoon working last minute things out especially given the experience of how the women’s session had started and was going. Lessons learned applied quickly for the next day. A big one tomorrow is coming for Axim to focus on it’s future and what they can do for themselves. Maryanne and Barbara were finding themselves in many places, and especially enjoyed sitting in on the women’s session in late afternoon, hearing some singing, and seeing the master duo of Susan and JJ with the HIV/AIDS presentation. If I’ve not mentioned someone, forgive me — I’ve tried to pick up the highlights from a day that had us scattered all over. People are so hospitable. The children are magnets, or maybe we are, as if they find us, and with camera, they hang on. Food is wonderful. Heat and humidity, well, I’ll save that for later. Signing off as my timelimit runs out and not time to check typing…. This is Jeanie and Suz before supper on the 29th. Saturday was a big day, huge day actually. We had received Ghanaian dresses/gowns for the women, and shirts/shorts for the men. We dresssed in these for the day. They were green with hands (helping hands) and 8 inch circles with GCJ in them. We gathered in Lower Axim at the King’s Palace for the Dur Bar. There was dancing with the children while we were waiting for the events to begin. We noticed that the local press was there with TV cameras! And some of the orphans that will live in the orphanage when it is completed were also there. A group of traditional dancers preceded the King and their attendants. 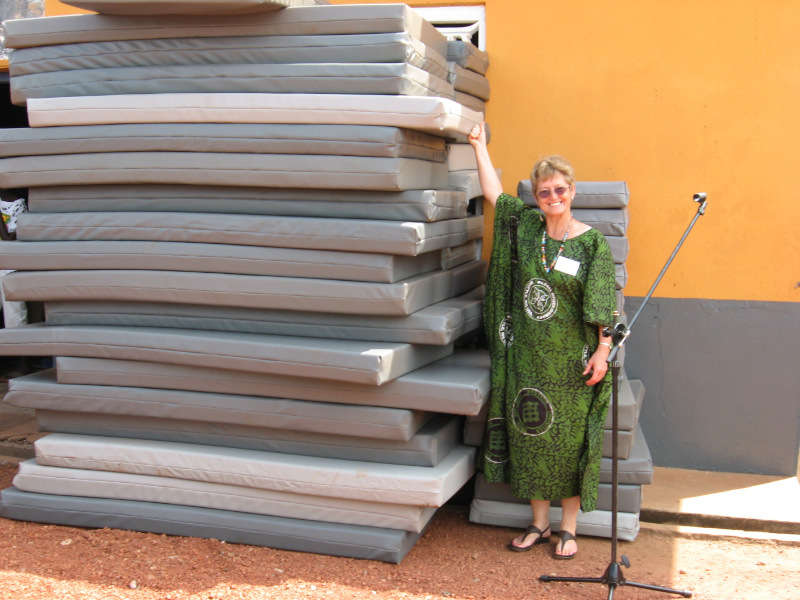 Jeanie was asked to make a formal presentation of the 60+ mattresses to the King. All of the mattresses were stacked against the inner wall of the palace “courtyard”. The King then presented the mattresses to the hospital along with all the glasses, and other medical supplies that we all had brought. Susan was asked to talk, while Maryanne disappeared into the King’s chambers. She came out to a fanfare of drums, dressed in traditional dress and shoes, braided fabric headress, with cloth laid down before her as she walked. She sat on a stool, with her feet on a goatskin, and was honored as the “Queen of Development”, a very honorable title and position. It was great! The rest of us each were given water, then liquor(Schnapps), and then given a Ghanaian name by the King. We went back to the hotel for lunch and Mustafa was there with his family – his wife and 2 children. Selma, the 5 year old daughter, and Suz spent the rest of the day hand in hand. We all went by bus for the Essiama (the hot, crowded bus), visited Dina’s school, and the Bonwire harvest festival to celebrate the end of hunger. Steven’s wife was also along as were several people who have worked GCJ in Ghana. We danced to the drums and walked along the beach. Then back for dinner and rest after a long day. Louise had spent the day filming all of the events. Tom showed us a DVD on smoking fish in Ghana. We are learning a ton! Sunday – a more relaxing day. Some of us found a shortcut trail to Axim which takes a lot less time than the bus and take us through a very friendly neighborhood. After breakfast, many of us went to church, and Rich gave a sermon at the Methodist church. Some of us went to lunch at Ankroba Beach Hotel hosted by Mr. Addae-Mensah, a gentleman who taught at UW on a Fullbright, and now has a son at UW as well. Afterwards some went to delegates houses to visit. Some of us are dealing with colds and fever, but most are healthy. Jackie spent the night at Dina’s house. Ravyn finds that walking on the shortcut is very enjoyable. Jerome is still telling bad jokes and just went into the sea for a great swim. Both Suz and Jeanie are looking forward to teaching classes tomorrow and for the rest of the week. Time for dinner. Hope you are all well. See you soon! to continue…all the delegates were thrilled by the opportunity to get out into the community and into working environments. We have wonderful Ghanaian delegates—women and men. They are open, articulate, participating fully in circle time, and sharing their culture, ideas, struggles with us and we with them. This afternoon will be special, because we will be formally received by the King of Lower Axim. This area is under a traditional/democratic combination situation. It will be a formal audience together with a meeting with the various department heads in whose organizations we are working. We’ll try to get a blog out on that. Tomorrow a Durbar is planned where they mattresses, computers, and books will be accepted and dedicated. For that, we all will have to wear African clothing, which they are making as a gift for us (big secret, don’t tell). The orphanage is coming along very very well. Today a truck is coming from Takoradi with a load of materials. The second floor walls are almost finished. The town is buzzing I think with all the activity going on. Speaking of the town, we’ve been touring is, meeting in it, walking through it. Poor. Yesterday, JJ, our journalist delgate from Accra, walked all over town looking for a newspaper and found not one. But the children look reasonably OK, people are very very friendly, very dignified, not shy particularly. We’ve learned some Fante phrases. We toured the slave castle—what a sad experience for all of us, North Americans AND Ghanaians. But now we are looking to the future, and honoring the past but not letting it control us. Well, enough for this time. The food is delicious—we all love it from both cultures. The internet connections are very iffy. The hotel is reasonably comfortable, and the staff is doing everything to make us welcome. The Catholics have let us use their bus for a reasonable daily amount. Rich will be preaching in two Methodist churches the next two sundays—has met with the Methodist minister here. More maybe tonight. Thanks to all who are reading this, following our journey, wishing us well, keeping us in your hearts. We feel we’re in a living learning laboratory here, and are so incredibly fortunate to be in this spot at this time. Medasi. Did we mention it’s hot and humid? Did we mention the fantastic ocean, good fish? We met the District Executive (mayor) who welcomed us and promised us protection while we are here. We are most grateful to the many officials who have extended the warm Ghanaian welcome to us and assured us of their interest and desire to leave “without incident”, as Exec. Ellima put it. All North American delegates arrived in Accra airport as planned! We had a reasonable night’s sleep. Nex morning, we had a “country briefing’ from Dennis Weller, the Deputy Director of USAID in Ghana. He was terrific–gave us much factual information about the country and US AID efforts esp in horticulture and some energy projects. After a quick lunch we visited the Archelogical Museum at U. of Ghana-Legon Campus–a university of about 37,000 students. We visited the Kwame Nkrumah memorial site—a beautiful area and monument honoring the father of Ghanaian independence. There we joined a small group of Ghanaians who entertained us with drums and taught us more about dancing! fun. We finished the day with a good Ghanaian meal and to bed. Yesterday was the long drive from Accra to Axim, stopping along the way to visit the Cape Coast Slave Castle and Museum-beautifully and respectfully narrated by our tour guide. Then a brief visit with the Western Regional Minister, a position equivalent to our governor. We were warmly welcomed—he promised a visit without incident and expressed his appreciate for our efforts. Then on to Takoradi, and JamKay, James’ factory where we met some of the Ghanaian delegates and took on some of the mattresses into our extremely crowded bus! The beach is beatiful, the weather hot and humid, the hospitality warm and very friendly. We made it! Now to engage in the journey of mutual respect, friendship, projects. All is well!! Hilight of our day yesterday, was a visit to the King of Nzema (the Paramount Chief), his retinue, and members of his assembly. It was an unexpected visit, and we each were asked to speak, according to particular protocols. Nana Kaku Bulu 11, James, reminded us today how he started with his hands behind his back and head down, until he had the sense that we were being well received. We had kept them waiting for over an hour, and they recounted our transgression, but forgave us. We noted how they were straightforward and frank. In the end, it felt cleaner. Today we met with many of the delegates and board members. Jeanie – you have the deputy director – a delightful young woman – nurse. Jackie – you have a strong, friendly business manager as a teacher. There is a teaching strike on now. We had the clear experience of cultural differences in communications and it was enlightening and interesting. Time is about to run out, so I had better post. Off to Accra to continue arrangements tomorrow. It is wonderful to be here. Looking forward to the whole group joining us. Great Ghanaian delegates! Today is Thursday. Yesterday we shopped some in the morning for supplies–water, etc in Takoradi, briefly visited James’ factory, and then drove to Axim. The countryside got lusher, more tropical. Lots of palm and rubber trees. Axim main street is narrow, crowded with people. We went directly to the room to the King of this area of this area, who is also on the WCHH Board. This was quite a formal ceremony. We were seated, and he and his retinue entered. Great respect was shown to all, and we were formally welcomed to Axim, not just as visitors, but as “one with us”, which you can imagine we appreciated very very much. James introduced us and each of us spoke about our project, our hopes, our activities, etc. It lasted perhaps an hour. Each person in the room was introduced. 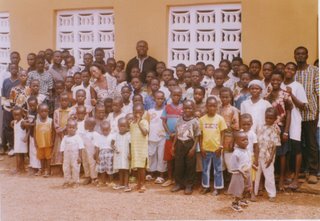 Mr. Bentil was there, Miss Frances Polly, the woman who chose which children to enroll in school, Stephen our civil engineering partner, and others. All were welcoming. Afterwards, we mingled briefly outside the room, looking directly out over the Atlantic Ocean. Although we were quite nervous and hoping we would not do something really rude, in James’ estimation all went well. Then we drove up the dirt road to the orphanage. It is looking really good—a nice substantial building. It was too dark to take pictures, but we walked through it, and kind of marveled at what has already been accomplished. Finally, in complete exhaustion, we went to the Beach Hotel, where we had a meal, met with the manager for some time trying to work out the details for the group, etc. The location is beautiful, but somewhat far from town. Today we will work out details here, meet with all the Ghanaian delegates that can come, meet with other leaders in the pm, including WCHH Board members, look over other possibilities in town for restaurants, etc. and then back to Takoradi. Tomorrow we plan to go back to Accra to wrap up arrangements there. Hi from an internet cafe in Accra, Ghana. We had an emotional meeting at the airport with James, and Kumi’s entire family. James waved a few magic waves and we were through customs before we knew it. On to the Ford Foundation and a good sleep! Now, we just finished a meal—we were brave and following James’ good advice, had all-Ghanaian dishes, and it was DELICIOUS! In the process we found a good restaurant to take the whole group to! What a day! We have agreed that perhaps never in our lives have we in one day encountered so many friendly, helpful people. We tried to deliver letters to various ministers for Dr. Joe, and a few of our own as well! We’re figuring out the money—it’s not easy to think in the hundreds of thousands for a simple meal! We bought supplies, including two printers for use in Axim. We most of all enjoyed the sights and scenes of people engaged in their ordinary workday, in traditional or modern dress. We saw so many small entrepreneurial businesses. We met Barbara’s banker friend who generously helped us get a good rate for some of GCJ’s hard-won dollars. And yes, there were some plumbing glitches, and an unexplained traffic jam, and it did get pretty hot and humid in the middle of the afternoon, but these are minor details at the end of our first day. Thanks to James, all went well and we are ready to take on tomorrow!! We’ll send more details in the next few days, depending on our internet access, which seems a bit dicey. ready to continue your contributions to our planet. Thank you for what your are doing. but is part of a larger energy helping to make our world a better place. 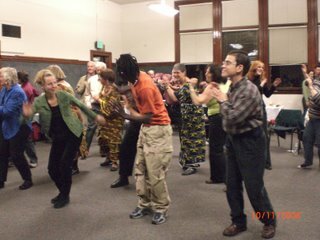 Learning how to dance “Ghanaian” at the GCJ Ghana Project Send-Off Party!! 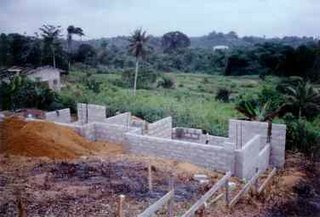 Here’s a picture from last month of the progress being made on the orphanage in Axim: soon we’ll see it for ourselves and add our own sweat-equity to the project. Excitement is building as we finalize packing and preparations. We hope you will join us at the great send off on Wednesday evening at University Heights Community Center in Seattle! We begin at 7 pm. The dance lesson will be awesome. See you there! This is the first message on the GCJ Ghana blog. Wednesday night, Oct 11, we will have our send-off party, with food, music, Ghanaian dance lessons, and well-wishes from the GCJ family and friends. One week from today (Oct 15) Barbara, Susan P, Maryanne and James will rendevous at the Accra airport.